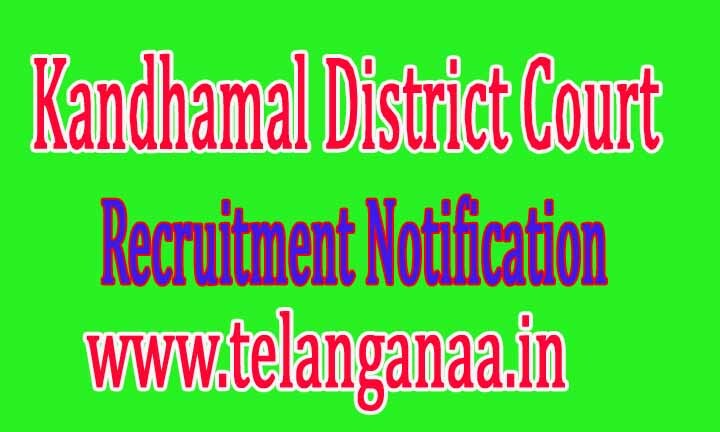 Kandhamal District Court has Recruitment Notification Released For 30 Stenographer, Grade III, Clerk posts. All incoming and interested potential candidates can offline Apply or before 07.10.2016 (7 October 2016). More detailed information on educational qualifications, age limit, selection, examination pattern, syllabus for Kandhamal District Court Recruitment 2016-30 stenographer, Grade III, Clerk Post is mentioned below. Age limit - As at 31-08-2016 32 Years - Candidates age should be between 18th Age relaxations will apply according to the rules. Education - should have candidates 12 / Diploma (DCA) or an equivalent qualification carried out by a recognized university. Selection process - all potential candidates are selected based on their performance in written examination, interview. Pay Scale - Rs 5,200 -. 20,200 / - With 2400/1900 / - Grade Pay. How to apply - all coming and interested eligible applicants must hardcopy application along with relevant testimonials (Mentioned in the detailed display) to the following address before or on 7 October 2016. Address registrar, civil courts, Phulbani. Last date of receipt of applications: 10.7.2016.